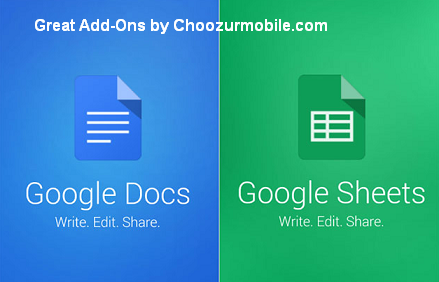 Google have recently launched Add-on support in Google Docs and Spread Sheets. Just similar to chrome web add-ons these small utilities will enhance the functions of Google's online office suite that is Google Docs and Sheet. The major difference between Google Scripts and Google Add-on is the scripts are more users friendly while add-on works behind the scenes. Scripts can work with any file in Google drive while add-on works just as chrome-add-on, particularly on the currently open file. Although add-ons work flawlessly with Google Docs, their source codes are hidden, unlike Google scripts. Most importantly Google Docs add-on can be severe as they are a more open source and cause issues such as unsecured sharing files with unknown users, viruses etc. Therefore, it is advised to be more cautious while running add-ons of unknown developers and note their add-on reviews carefully. Google Scripts works well with new and old spreadsheets while recently launched Add-ons works only with the new version of sheets. This could be little annoying for a long time Google docs users. Workflows from Letter Feed - Automatic assistance for getting approvals from reviewers through mail. HelloFax - Send and receive faxes online. MailChimp - Send mails directly from Google Doc instead of usual Gmail. PandaDoc - Share a document with your client and get legally binding e-signature in a short time. ProWriting Aid - Make your writing more perfect with word-like checking utility. Avery's Label Merge - Merge Google datasheet into labels and name badges. Charts - Build Charts from data easily. EasyBib - Easy creation of bibliography and citations online through Google Docs. Thesaurus - Check grammar and consistency of your self-made articles. Make your writing more perfect. Mapping Sheets - Add-on will prepare a Google map with your place details made on a spreadsheet. Analytics Canvas - Pull your analytics reports into Google spreadsheets. Translate - Self-advising easy online translation in you Doc. TextHelp - A highlighter for your Google documents. Prepare your own notes in Documents. Abbreviation Lists - Use correct abbreviations in your writing. Gliffy & Lucidchart diagrams - Make flowcharts, diagrams and other professional diagrams instantly. UberConference - Create conference call with all Doc viewers. Track Changes - Keep an eye on editing your documents. Doctopus - One of the most favorite among teachers for project assignments. Easy tool for managing student projects online at one place.